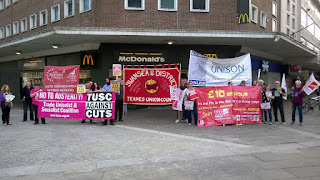 Swansea Trade Unionist and Socialist Coalition (TUSC): Will the party your union funds support TUC policy? Will the party your union funds support TUC policy? This weekend all across the world, workers will be celebrating May Day. 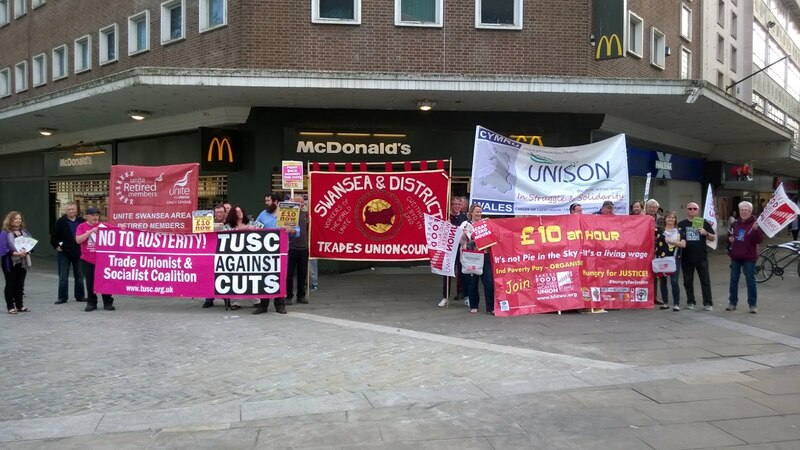 The Swansea Trades Council takes place in Castle Square at 12.00 mid-day, today ( Saturday 2 May). • A minimum wage of £10/hour, with no discriminatory youth rates! • An end to zero-hours contracts! • Unshackle the trade unions - repeal all the anti-trade union laws! • Bring energy and other utilities into public ownership so that resources can be planned to meet people's needs and not for profit. • Nationalise railways, postal services and the banks and finance houses under democratic public control. All of these policies are TUC policy, voted for by delegates from all of our trade unions but the Labour Party, which too many of our unions continue to pour money into, doesn't back any of them. TUSC is the only party that stands unreservedly on trade union policies. As you celebrate May Day this weekend, unless you're an RMT member (RMT is affiliated to TUSC), ask: when will your union back the only party which has the same policies as you do?